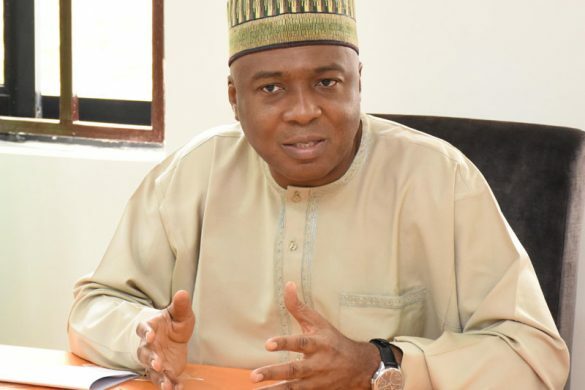 Transporters under the aegis of Motorcycle Riders Association of Nigeria in Kwara state, has assured the Senate President, Dr Bukola Saraki of their support ahead of the 2019 general elections. The motorists assured Saraki that they would vote en masse for Saraki and all the candidates of his party at both the state and federal levels during the elections. The secretary general of the association, Malam Murtala Yusuf announced the decision of members of the union to queue behind Saraki during the coming elections during the presentation of a Siena bus to the union by the Senate President. Yusuf said 2019 will be the pay back time for Saraki to reciprocate his numerous kind gestures to the transporters. Presenting the car key to officials of the association, the Director General of the ABS constituency office, Ilorin, Alh Musa Abdullahi thanked the members of the Joint Motorcycle Association Of Nigeria, Kwara state chapter for their support for Saraki . He said: “The presentation of the vehicle donated to the association by our caring and welfarist leader, Dr Bukola Saraki is in recognition of your support for the Saraki political dynasty and the ruling All Progressives Congress ( APC) in the state. The gesture of our leader is to complement the state government’s efforts at making life comfortable for tricycle riders in the state. “This is not a campaign ground, but I must seize this ample opportunities to list some of the areas of the intervention of the Senate President, all aimed at making life comfortable for the larger number of people of his constituency and Kwara state at large. “As a caring leader, Dr Bukola Saraki quickly rose to the occasion when a devastating flood displaced hundreds of people in Ilorin, especially those in Alore- Abata- Asunkere about a fortnight ago. He did not only direct us to make an immediate arrangement for the accommodation of the victims, he also asked us to make provisions for their feeding and their other immediate needs. “He followed this up yesterday by releasing N5 million for distribution to the flood victims to ameliorate their conditions. And determined to find a lasting solution to the incessant flooding in Alore/ Abata- Asunkere area of Ilorin West local government area, our leader has tasked the Federal Ministry of Environment to ensure a speedy completion of the channelisation project in the area which he facilitated during his first tenure in the Senate. “I have also, on behalf of the Senate President early this morning led a delegation on sympathy visits to flood victims in Oloje area and its environs. During the visit, we delivered Dr Bukola Saraki’s messages of love and hope and our hosts were appreciative of our leader’s concern for their plight. “Health is wealth, as the adage says. I’ m delighted to announce here that work is in progress at the multi- million naira Federal Medical Centre at Ita- Nma Okolowo axis of Ilorin. The gigantic project was facilitated by the Senate President. Upon completion, the facility will not only bring qualitative health care to the doorsteps of our people, but will also bring about thousands of both direct and indirect job opportunities for our people, both old and young. “Permit me to also say that our leader has done a lot in the education sector; from bankrolling the WAEC/ NECO fees of indigent students, distribution of free JAMB forms to our youths, sponsoring of some first class graduates for the in Masters Degree and some Islamic scholar for further study at Al- Azhar university, Cairo, Egypt. ‘The Senate President has also made good his promise to engage in sponsorship of our people on holy pilgrimages on to Israel and Saudi Arabia. He kick- started the scheme during the just concluded Ramadan fast by sponsoring scores of Muslims to Saudi Arabia for Umrah( lesser pilgrimage).